Boil water and add noodles. Let set for 10 minutes. Scramble eggs in oil or make egg sheets cut to thin strips. Thaw spinach leaves and cut in strips. Drain noodles and mix all remaining ingredients in fry pan. Add hoisin sauce, and ginger, garlic, soy, red pepper flakes to taste. 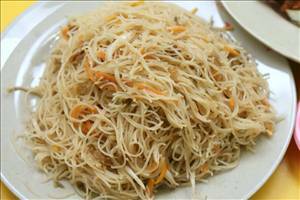 There are 263 calories in 1 serving of Chinese Rice Noodles. Calorie break-down: 15% fat, 78% carbs, 8% protein.